Axolotls are large aquatic salamanders only found in parts of Mexico. 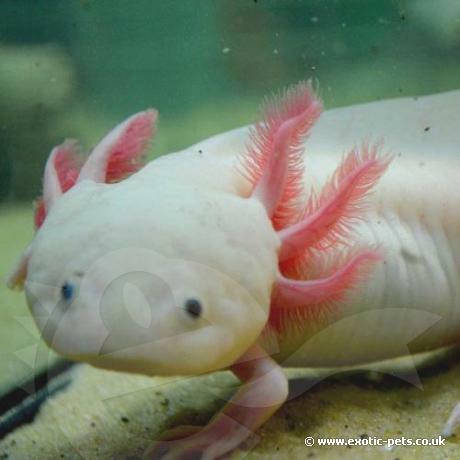 They are easy to keep and grow to an impressive 30cm, making the Axolotl a popular exotic pet. What does an Axolotl look like? Axolotls are available in around five colour variations; black, white, wild type, albino and a golden colour. They grow to approx 30cm (12in) and will live for approx 12 years in captivity. Axolotls are studied around the world, due to their ability to regenerate a new fully functional limb within two months of losing it. Where do Axolotls come from? Axolotls are only found in certain parts of Mexico, the canal systems of the former Lake Xochimilcho. Officially an endangered species they have been captive bred since the 1800s. How do you keep Axolotls? A good set up for one Axolotl would consist of an aquarium of 60 x38 x30cm (24 x 15 x 12in). The water should be around 10-20 C (50-68 F) and shallow, as deep as the Axolotl is long. Decorate the aquarium with a mixure of plastic plants and oxygenating plant, with maybe a couple of large pebbles. However, don't over crowd your set up - make sure your Axolotl has plenty of space. Keep your set-up out of direct light as Axolotls don't have eyelids and are sensitive to too much light. You can use an internal water filter to help keep the water clean (keeping in mind Axolotls like the water relatively still). Weekly cleaning of pebbles/plants and a partial water change is recommended. Remember, do not use water straight from the tap, let it stand for 48hrs before introducing to your aquarium. Avoid using any size gravel that can be swallowed; causing ill health and can even be fatal. Although best kept alone, a few Axolotls of a simlar size can be kept together. If not fed regularly or if they don't have enough room, Axolotls have been known to bite off each others limbs. They feed on a varied diet from crickets to worms, eating nearly anything that will fit in their mouth (they love freshwater shrimp and will eat pellets). For further reading we recommend Keeping Axolotls by Linda Adkins. From time-to-time we sell imperfect Axolotls at a reduced price, this usually means one or more limbs are missing/damaged. A missing limb should grow back within a couple of months. Imperfect Axolotls are healthy, and only sold when we are happy that any missing limbs are healing well. We are regularly asked for pellets for Axolotls, so we are now offering the sinking pellets we feed our Axolotls. Buy Axolotl Pellets. We do sell Axolotl Spawn; it is only is on site for a limited period and sells fast. If you're interested in some Axolotl eggs, please request an e-mail update via the E-mail Notifications link below. For some helpful tips, read this article on rearing Axolotl Spawn. Caution: Please Note! When providing water for your amphibians, this MUST be treated with an Aquarium de-chlorinated solution. The Chlorine will harm and possible kill your amphibians after a period of time. Alternatively, you can use fresh, clean rainwater!